Lost Nation Theater has brought back Stone, Kim Bent's original 2005 play chronicling the early days of the granite industry in Barre, for a run in the historic shed that's now home to the Vermont Granite Museum. Performed by an ensemble of seven on a platform in the big timber-frame space, the show takes on a casual, friendly feeling. It's a mix of oral history and traditional music that looks at a whole community that prospered and suffered from stone. Bent created the piece by blending excerpts of interviews conducted by Marie Tomasi and Roaldus Richmond in the 1930s, edited by Alfred Rosa and Mark Wanner into the book Men Against Granite. The result is more description than reflection, more facts than insights — it's the story of what it was like in Barre, not what the granite industry meant. Such recollections are history without the analysis. The two types of granite work required different skills, but both were tragically dangerous. Work in the quarries pitted men versus stone in the most direct way, and everything that aided them — explosives, winches, drills — could hurt them just as easily. In the sheds, the men cutting, carving and polishing stone inhaled granite dust that led to lung disease. The unyielding granite destroyed both brute labor and artisanal skill. The immigrants who gravitated to the quarries came from Italy, Scotland, Canada, Ireland, Spain and Sweden. Given their cultural differences, the tension probably went beyond trading racial slurs, which is where Stone's dramatization stops. The ethnic jokes in the show have no sting, as long as you look beyond the flagrant stereotyping. There's even a tongue-in-cheek song about harmony, with Bent's only original lyrics in the show, called "In Barre We All Get Along." Still, who wants to revisit the prejudices of the past? The fact that these people did live side by side is the part worth celebrating. The production uses music lavishly, both to personify the characters and to create scene transitions. Italian and French Canadian tunes predominate, but it's a big musical melting pot. The acting ensemble occasionally breaks into song, singing can't-help-myself tunes together and in solo performances. The music triggers some dancing, too, and even when the company isn't dancing, it's moving with bright energy. Director Bent emphasized a crisp pace. 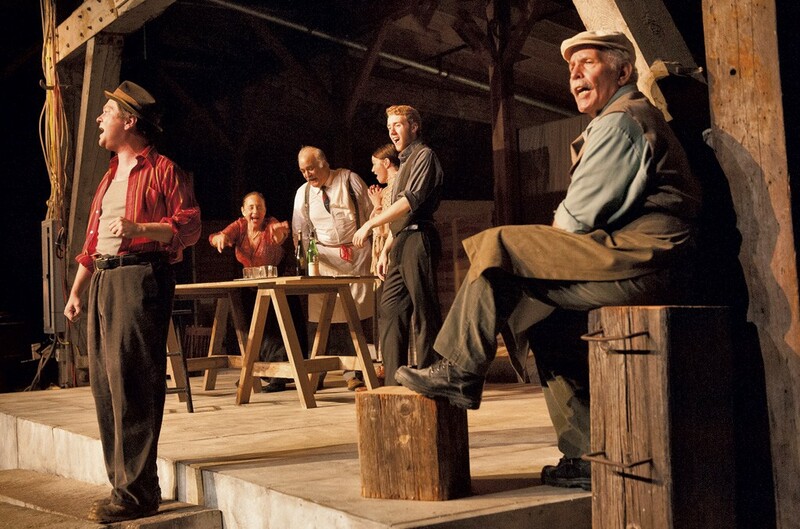 The seven actors and three musicians all have a warm approach and connect directly with the audience. They're here to entertain, and most of the performances are aimed at the spectators rather than enacted among characters. For theater, it's artificial; for storytelling, it's just fine. Musical director Robin Russell takes us on a trip through musical traditions of different eras and nationalities. She plays accordion and piano and is joined by Mike Fiorillo on guitar and Cynthia Thomas on fiddle. The three of them fill that big granite shed with everything from Irish jigs to Italian drinking songs. The line between musicians and actors is delightfully blurred here. Russell takes a few turns onstage, and actor Aaron Roberts incorporates his accordion playing. The shed blurs conventional theatrical conventions, too. The open space can't mask actor entrances and exits. We watch performers duck behind a wall and emerge in different costumes to step back up on the platform. Celest DiPietropaolo plays the role of Elia Corti, the stonemason who worked on the Robert Burns memorial in downtown Barre. He remains on stage throughout, in the iconic apron and vest that Corti's granite statue has made familiar to residents and visitors. The sculptor is a stoic presence — not quite a narrator, but a voice that helps make transitions. The other actors take on at least six roles each, for the play moves swiftly through brief vignettes and monologues. Scott Renzoni proves adept at quick characterizations and can turn on a dime from accent to accent. Mark Roberts tackles nearly a dozen roles, finding little notes of humor, weariness or warmth to bring them briefly to life. Aaron Roberts is earnest as a Swedish immigrant, a young lover and a boastful quarryman, among others. Taryn Noelle, Sandy Gartner and Jude Milstein appear most memorably in a scene in which all three are widows coping with the loss of young husbands. Though the material is more monologue than dialogue, Bent makes it richer by setting the remembrances in a side-by-side presentation. The performances are more documentary presentations than full characterizations. There are some stiff moments and self-conscious acting, but the essential pleasure of Stone lies in listening to lively music and hearing the voices of the past. Staging the play in the Granite Museum adds another dimension to the historical storytelling. The vast shed was once the scene of granite manufacturing, from design to polishing. In truth, the building lacks the acoustics and sight lines for theater, but the presence of the museum's artifacts somewhat compensates. And those tall timbers help the viewer imagine the world the play presents. Donna Stafford created a simple set using granite blocks piled on a platform she painted — in a stunning illusion — to mimic granite. Lighting designer Wendy Stephens does an admirable job of bringing theatrical lighting to a rugged, utilitarian space. The show is performed with plenty of natural light pouring through the windows as well, putting audience and actors in a shared space that suits the eye contact made in storytelling. To summon up several dozen characters and give each a distinctive touch, the production relies on Cora Fauser, the costume designer. Her endless supply of hats, suspenders, dresses, work clothes, aprons and vests helps signal the play's range of periods and people. Stone is a gift to anyone in the area who was touched by the granite industry or is curious about Barre's heritage. Anyone reluctant to set foot in a theater will find it pleasantly devoid of self-importance and without dramatic pretensions. It shouldn't be mistaken for drama, and that's a virtue for its intended audience. Bringing this evening of rousing music and plainspoken history to Barre's Granite Museum is bringing it home. The original print version of this article was headlined "Etched in Stone"